Whether they have been over-parented or under-parented, they are now journeying with you and you are the de facto family. You take over now from where their parents left off, whether you know it or not. The parenting journey continues into the workplace where they will spend more time with you than they do with their family or friends. As a manager you will shape them in one way or another. 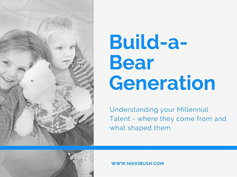 With her insights and experience as a speaker, author and parenting thought leader, Nikki Bush will help you to understand this generation from her unique point of view. These pearls of wisdom will be invaluable as you journey forward, finding ways to connect with, and lead, your Millennials to mutual success. A one-hour keynote presentation. Also an excellent precursor to the keynote presentation called Becoming a Journeyman.